Recognized as the mark of accomplishment in luxury markets around the world and the official luxury designation of many national and international brands, the Certified Luxury Home Marketing Specialist® (CLHMS) designation assures affluent buyers and sellers that the agents who have earned it have the knowledge, experience, competence, and confidence they require. 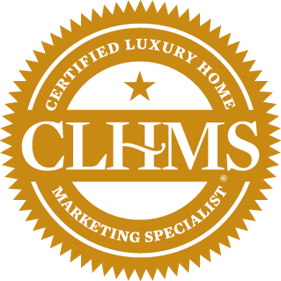 Agents who hold the CLHMS designation are Members of The Institute who have completed required training and have successfully demonstrated their expertise in the luxury home and estate market. The Certified Luxury Home Marketing Specialist® designation is a mark of individual accomplishment. It is not awarded at the team or company level. In addition to the CLHMS designation, agents may also earn the Million Dollar Guild recognition. ©2019 The Institute for Luxury Home Marketing. All rights reserved. trademarks of The Institute for Luxury Home Marketing and may not be used without permission.